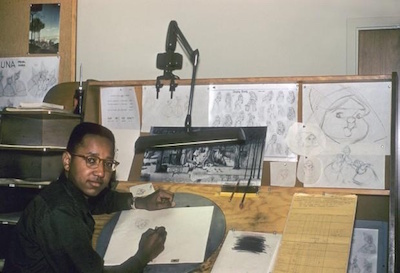 Floyd E. Norman is an animator, comic book artist, and script writer who made history in 1956 by becoming the first African American cartoon animator at the Disney studios, where he worked directly with Walt Disney. Norman was born on June 22, 1935, in Santa Barbara, California. His parents, James Norman and Evelyn Davis Norman, were originally from Natchez, Mississippi. Norman’s interest in art and cartooning began in childhood after his mother took him to see the classic animated Disney film Dumbo in 1941. The next year, Norman saw Disney’s Bambi, by which time he had pretty much decided he wanted to be a cartoonist working for Disney when he grew up. After graduating from high school in Santa Barbara, Norman took his portfolio to the Walt Disney Studios in Burbank, California, whereupon he was advised to go to an art school. Early in his career, Norman worked as an assistant for Bill Woggon, who also lived in Santa Barbara and who created the popular Katy Keene comics. Norman registered at the Art Center College of Design in Pasadena, majoring in illustration. In 1956, during his third year there, Norman was invited to work at Walt Disney Productions as an animator on the film, Sleeping Beauty, so he dropped out of school in order to accept the offer for his dream job. Work on Sleeping Beauty wrapped up in 1958, at which time Norman got drafted and served in the military for a couple of years during a lull in the Korean conflict. In 1960 Norman returned to the Disney studio to work on One Hundred and One Dalmatians, followed by The Sword in the Stone, and then The Jungle Book. After Walt Disney died in 1966, Norman and three partners founded Vignette Films, Inc., which became one of the first studios to make animated films on black history. In the early 1970s, Norman returned to the Disney studios to work on the animated film Robin Hood. During the course of his career, Norman worked on various animation films and series at other top animation companies: Hanna-Barbera, Film Roman, Ruby-Spears Productions, and Pixar. In the 1980s, Norman again worked at Disney as a writer and scripter in the comic strip department. Norman contributed to The Hunchback of Notre Dame (1996), Mulan (1998), and Dinosaur (2000) for the Walt Disney Animation Studios. He worked on Toy Story 2 (1999), the same year he and his business partner and fellow animator, Leo Sullivan, created Afrokids®.com, an Internet site that promotes multicultural and African American images to children. After finishing work in 2001 on Pixar Animation Studios’ computer-animated feature, Monsters, Inc., Norman officially retired. However, to this day he likes to keep involved in the business by doing occasional work as a freelance consultant and storyboard artist on various projects. Norman is married to Adrienne Brown, who as an artist also worked for Disney Publishing. Among the accolades Norman received over the span of his nearly sixty years in the animation profession have been the Winsor McCay Award from the International Animated Film Society in 2008, the Inkpot Award from Comic-Con International in 2008, and the Sergio Award from the Comic Art Professional Society (CAPS) in 2013. Norman’s lifelong association with Disney was reflected during ceremonies on October 10, 2007, when he received that year’s Disney Legend Award.